童玉平, 徐峰, 崔鹏, 文翠华, 杨维康. 巴音布鲁克国家级自然保护区繁殖鸟类调查[J]. 四川动物, 2017, 36(6): 702-707. TONG Yuping, XU Feng, CUI Peng, WEN Cuihua, YANG Weikang. Breeding Birds in Bayanbulak National Alpine Grassland Nature Reserve of Xinjiang, China[J]. Sichuan Journal of Zoology, 2017, 36(6): 702-707. *通信作者 Corresponding author, 杨维康, E-mail:yangwk@ms.xjb.ac.cn. Abstract: Bayanbulak National Alpine Grassland Nature Reserve (BNAGNR) is famous for its key role for protecting the breeding water birds such as Cygnus cygnus, Grus grus, and Anser indicus. Meanwhile, BNAGNR is the first nature reserve of protecting C. cygnus in China. In this study, the diversity of breeding birds in BNAGNR was surveyed in May and June, 2014-2016 (twice per year). A total of 61 bird species belonging to 47 genera, 24 families, and 11 orders were recorded, and summer visitors and residents were the dominant species. Specifically, Ciconia nigra, which is Class Ⅰ nationally protected bird species, was ever recorded in 2 different places with 4 individuals. 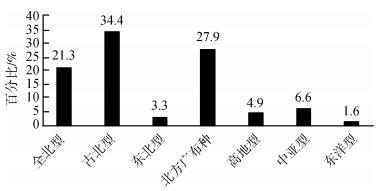 Seven species of Class Ⅱ nationally protected bird species, including C. cygnus, G. grus, Anthropoides virgo, Falco subbuteo, Aquila nipalensis, Milvus migrans, and Gyps himalayensis were also recorded. Water birds such as C. cygnus, Tadorna ferruginea, and Tringa totanus, and grassland birds such as Eremophila alpestris, Oenanthe isabellina, and Carduelis flavirostris were dominant species in BNAGNR. Notes：Species percentage means the number of species in one order accounts for the total number. Notes：Distribution pattern：C. Holarctic，U. Palaearctic，M. Northeast，D. Central Asian，P. Upland，W. Oriental，O. wide distribution species in the north；Resident type：M. passage migrant，S. sum mer visitor，R. resident；Level of number：+++. dominant，++. common，+. rare，±. seldomly seen，the number means the total number of 3 years' survey. Notes：Data resources：Li et al., 2012；Zhang et al., 2014. 程松林, 毛夷仙, 袁荣斌. 2014. 江西武夷山-黄岗山西北坡森林繁殖鸟类多样性调查[J]. 生态学报, 34(23): 6963–6974. 丁涛, 李远, 刘艳. 2009. 巴音布鲁克草原主要植被NDVI变化与气候因子的关系[J]. 遥感信息, 2009(1): 53–59. 董超, 张国钢, 陆军, 等. 2013. 新疆巴音布鲁克繁殖期大天鹅的生境选择[J]. 生态学报, 33(16): 4885–4891. 高行宜. 2005. 新疆脊椎动物种和亚种分类与分布名录[M]. 乌鲁木齐: 新疆科学技术出版社. 戈峰. 2008. 现代生态学[M]. 北京: 科学出版社. 蒋志刚, 纪力强. 1999. 鸟兽物种多样性测度的G-F指数方法[J]. 生物多样性, 7(3): 61–66. 李敏, 陈文婧, 魏炜, 等. 2012. 内蒙古中部地区繁殖鸟类多样性调查[J]. 动物学杂志, 47(3): 102–108. 李忠秋, 蒋志刚, 李春旺, 等. 2006. 陕西老县城自然保护区的鸟类多样性及G-F指数分析[J]. 动物学杂志, 41(1): 32–42. 马鸣, 才代, 付春利, 等. 1993a. 天山巴音布鲁克鸟类调查报告[J]. 干旱区研究, 10(2): 60–66. 马鸣, 才代, 顾正勤, 等. 1993b. 大天鹅繁殖生态及嘴型变异[J]. 干旱区研究, 10(2): 46–51. 马鸣. 1993. 野生天鹅[M]. 北京: 气象出版社. 马鸣. 2011. 新疆鸟类分布名录[M]. 北京: 科学出版社. 时卉, 杨兆萍, 韩芳, 等. 2015. 干旱区高山湿地生态风险时空变化——以巴音布鲁克自然遗产地为例[J]. 干旱区研究, 32(3): 614–621. 徐峰, 杨维康, 徐文轩, 等. 2012. 新疆准噶尔盆地南缘荒漠环境的鸟类[J]. 四川动物, 31(6): 980–982. 约翰·马敬能, 卡伦.菲利普斯, 何芬奇. 2000. 中国鸟类野外手册[M]. 长沙: 湖南教育出版社. 张雨薇, 赵利军, 许海珍, 等. 2014. 内蒙古中部地区湿地繁殖鸟类多样性调查[J]. 湿地科学, 12(6): 703–708. 郑光美, 王岐山. 1998. 中国濒危动物红皮书:鸟类[M]. 北京: 科学出版社. 郑光美. 2011. 中国鸟类分类与分布名录, 第二版 [M]. 北京: 科学出版社. 郑光美. 2012. 鸟类学[M]. 北京: 北京师范大学出版社. Howes J, Bakewell D, Bureau AW. 1989. Shorebird studies manual[M]. Kuala Lumpur, Malaysia: Asian Wetland Bureau. IUCN. 2017. The IUCN Red List of Threatened Species. Version 2016-03.[2017-02-08]. http://www.iucnredlist.org.